For the first of my simple SEO tips, I wanted to look at How to Choose a perfect Domain Name for Blog. If you are serious about creating maximum internet traffic for your website, then you really should start from scratch, by setting up a brand new website and considering which domain name to choose for it using SEO (search engine optimization). This is because search engines, such as Google, will take the domain name into account when ranking the website in their search results. 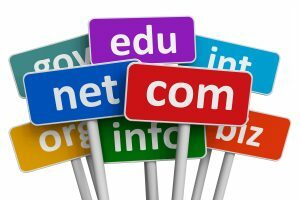 There are a number of important factors that you need to take into account when choosing a domain name. This article will spell out what those factors are and guide you towards making the right decisions for your particular circumstances, with the aim of helping you to choose good domain names that will attract maximum amounts of internet traffic. Choosing good domain names is not an absolutely exact science. This is because Google keeps secret the details of the calculation they make when assessing how highly a website should rank in their search engine rankings (the calculation is known as the ‘Google algorithm’). You will therefore discover some disagreement over certain elements of the process of choosing a good domain name if you search online. However, where there is disagreement, I will aim to explain the different sides of the argument and give my tips for moving forward. One particular difficulty with choosing a domain name is that sometimes there is a conflict between going with a brand, or generic name, and making your website name Google friendly with regard to search engine optimization (SEO). It can also be true that some of the most suitable website names might have previously been chosen and this can create practical limitations when it comes to picking website names, but I will suggest possible ways to get around these problems. First things first, this might sound obvious, but if your website is going to represent a specific business or brand, then you should always aim to choose a domain name that is the same as your website name. The reason that this doesn’t always happen is because sometimes the domain name that appears to be the most suitable is already taken. The website name and domain name are your online brand. However, so you shouldn’t confuse the customer by not having them the same. Imagine if Microsoft’s website was called “Microsoft”, but their domain name was computersolutions.com? Or if Google’s website was called “Google” but their domain name was cleversearch.com? It just doesn’t work having different website names and domain names. This makes things difficult for existing businesses who want to move onto the internet and keep their name, if the domain name has already been taken by someone else. However, if your business aims to mainly make its money online, then you should seriously consider changing its name so that it ties in with an available domain name. Basically, if you want an existing business to succeed on the internet, in terms of branding and SEO, then you need to choose the name of your business or brand at the same time that you choose a domain name. Brand name or generic name? One choice which can be difficult, is whether to choose a generic domain name such as carsandmotorbikes.com, or go for a business name such as michaelsmithcars.com. My simple SEO tip in this regard would be that if it is Google traffic that you are chasing above all else, choose a generic domain name. This is because the generic domain names are more likely to contain words that will crop up in your articles and posts and improve your SEO. The only exceptions to this rule are for big companies that are household names, like Yahoo say, or for certain sorts of business, such as restaurants, where the promotion of a brand name is vital. It also helps if the domain name that you choose is intuitive and makes it fairly obvious what the website does from the name. From an search engine optimization perspective (SEO) a website will do better in terms of Google traffic if the domain name contains effective key words or phrases that you will be using in your website content. For instance, if your website trades in use motorbikes and cars, then you might want to include words in your domain name such as “buy”, “motorbikes”, “cars”, “online”, “used”. A good idea is to pick several keywords and try them out in different combinations. You can find the best keywords to include in your domain name by using the Google Keywords Tool. One way around the problem of a domain name not being available is by putting hyphens in between the words that make up the domain name. This site, for instance, is called simple-seo-tips.com. The hyphenated version of a website name is sometimes available to buy as a domain name when the non-hyphenated form isn’t. 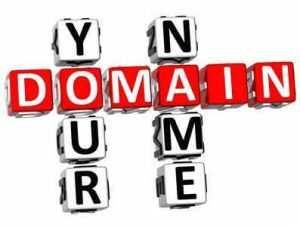 The disadvantage of hyphenated domain names is that people can easily confuse it with the non-hyphenated version of the domain name, especially when they type the domain name into the address bar, when it is easy for a customer to forget to include the hyphens and go to a rival site. You will see plenty of debates online about whether hyphenated domain names have a positive or negative impact on the domain name’s performance with respect to SEO. My opinion, based on experience, is that hyphenated domain names do not perform any better or worse than non-hyphenated ones. Generally speaking, your domain name should be the shortest that you can get away with. This makes it easy to remember and also allows more url characters to be left over for use in your posts. That said, you do want to get some keywords or keyword phrases into the domain name for SEO purposes so don’t get too obsessed with shortness. Also, many of the shorter domain names have already been used up, so your choices of short domain names to choose may be limited. Another area of discussion with regard to domain names is whether you should always choose a domain name that ends in dot.com, or not. The first thing that I would say is that in terms of simple SEO, it won’t affect your levels of internet traffic, whether your domain ends in dot.com or dot.info or dot.org or anything else. Many members of the public, however, will automatically assume that a website’s name ends in dot.com, however, and remember it that way. Plus some people (wrongly) see a dot.com domain name as having more authority. If you do buy the dot.com version of the domain name, you may also want to consider buying up the dot.net and dot.org versions etc. to have control over the name. The main advantage of not getting a dot.com is that the domain name is less likely to be taken, plus it might well be cheaper to purchase. Country specific domain names, such as dot.co.uk in the UK, are often the most suitable for certain sorts of businesses too, especially if they are locally based, rather than international. 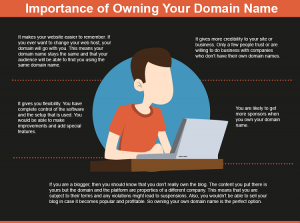 So above these factors is very important for choosing a domain name for your blog. 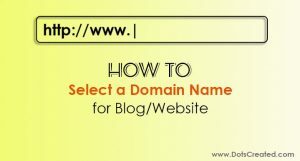 I hope now you understand How To Choose A Domain Name For Blog will helps you to choose the right domain name.